While working on a wood bowl in my workshop I noticed a lot of Altocumulus clouds that were turning into ice crystals. 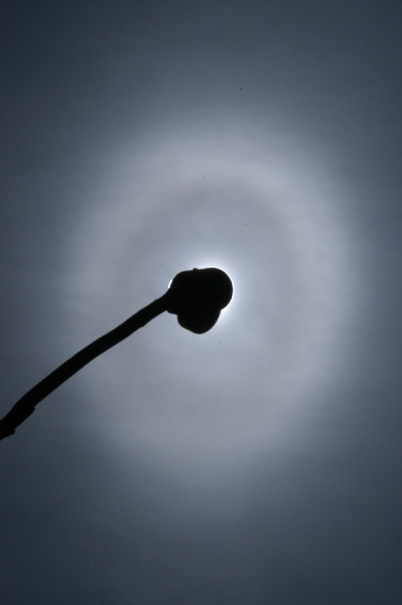 That meant a chance of elliptical halos. 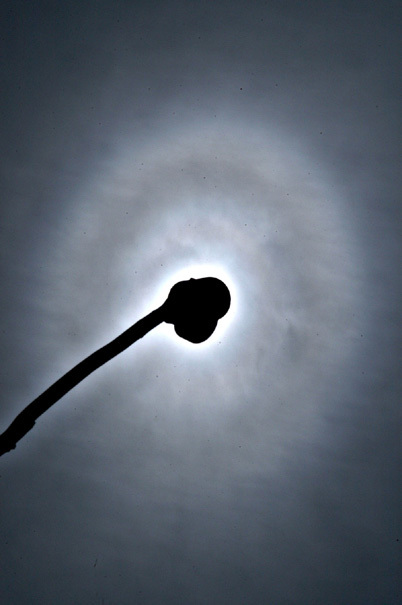 I took my camera, went for a walk, looked up and there actually was an elliptical halo! 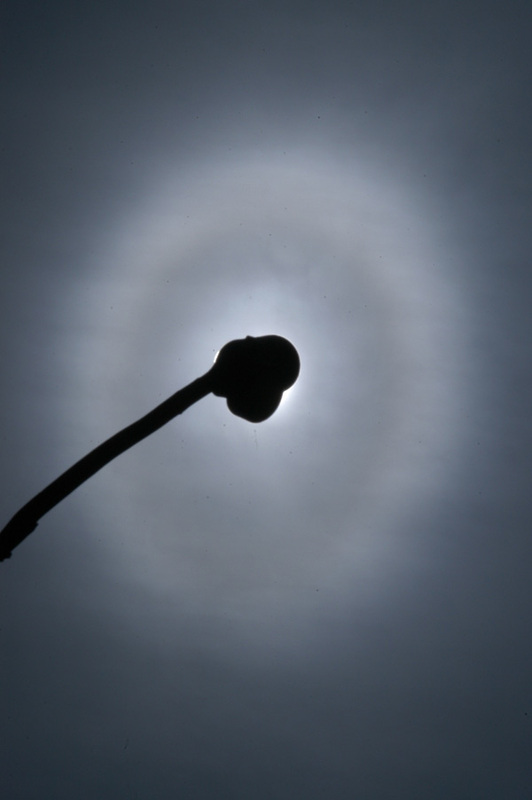 I ran like mad to get a macro lens and then used a telephone pole to shield the sun while shooting. 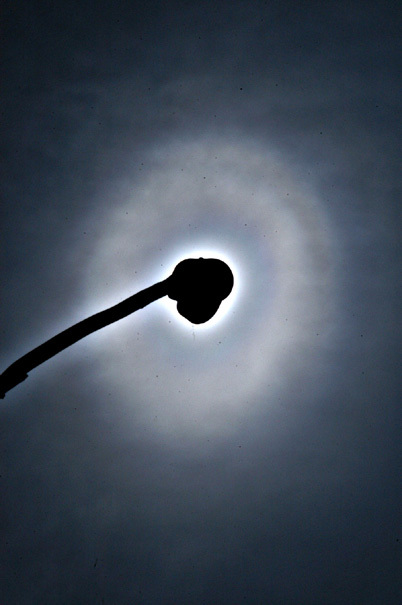 After about 10 minutes the halo was gone but I kept a vigil on the sky. Patience was eventually paid off as more dissipating Ac cloud moved in and the display came back. 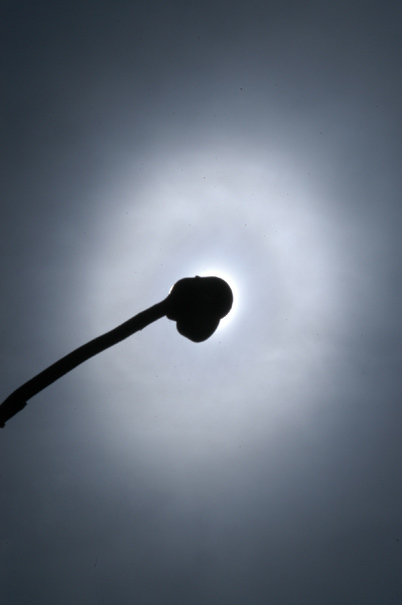 I later positioned a large wood stick with lens case to block the sun and laid on my back and watched the show. The magic really began when a large Ac fragment passed in front of the sun and turned into ice crystals. It showed three elliptical halos at once, sharp and bright and they were colored like the classical halos ( 1 - 2 - 3 ). The display lasted for two hours. One thing I noticed while laying on my back and taking photos was that the ellipse would start out large and then gradually shrink. Congratulations, Michael! It seems the Easter bunny brought you a very stylish and fitting present. An Easter egg in the sky. So much better than the ones made of chocolate. Michael Ellipstad did it again! Hey Marko now thats funny right there. Ellipstad where did you get that? Ellitical halos also tought me not to ever ignore the mid-level AC clouds. I wish I was in a jet and could have gotten a bottlinger ring too. I want one of these in diamond dust.